Carlos Guastavino: (b Santa Fe, Argentina, 5 April 1912; d Buenos Aires 29 October 2000). Argentine composer and pianist. In his early years, he studied the piano with Esperanza Lothringer and later with his cousin Dominga Iaffei Guastavino. He studied chemical engineering at the Universidad del Litoral, before going to Buenos Aires in 1938, having received a grant from the Santa Fe Ministry of Public Instruction to study music at the National Conservatory. But on arriving there, instead of entering the conservatory, he elected to take private lessons with Athos Palma (composition) and Rafael González (piano). His earliest published songs and piano pieces date from around this time, as does his only stage work, the ballet Fue una vez. Beginning in the mid–1940s, Guastavino’s music gained increasing local and international acclaim thanks to his own performances and those by other artists, such as the pianists Rudolf Firkušný and Inés Gómez Carrillo. In 1948 Guastavino went to London, where he stayed for two years on a grant from the British Council. He performed his songs and piano music throughout Great Britain and Ireland, and in 1949 Walter Goehr and the BBC SO played his Tres romances argentinos. Later tours included trips throughout Latin America and, in April 1956, to China and the former Soviet Union. Guastavino’s concert appearances declined during the 1960s as he focussed increasingly on composition and accepted various interim teaching positions in Buenos Aires, including spells at the National (1959–73) and Municipal (1966–73) Conservatories. Disillusioned by the neglect of critics and colleagues and possibly depressed over the death of his mother, Guastavino stopped composing abruptly in 1975. He began writing again in 1987 on the encouragement of Carlos Vilo, whose vocal chamber ensemble gave many performances of Guastavino’s songs. He wrote or arranged numerous works for Vilo’s group before retiring from composition for good in 1992. Guastavino came of age artistically during the 1940s, an era of strong nationalist sentiment in Latin America, and even after the movement’s decline in the 1960s, most of his works show at least some nationalist influence. They also demonstrate a tender nostalgia for Argentina, its people, and especiaaly its wildlife in such works as Pajaros (1974) and Diez Cantilenas argentinas (1958). Guastavino also draws on gauchesco and Indian traditions, invoking Argentine folk idioms in the Cuatro canciones argentinas (1949), and in piano pieces such as Gato (1940), Bailecito (1940) and Pampeano (1952). He voiced strong objections to contemporary musical trends, and his own music never diverges from tonal harmony and traditional forms. As his output in large-scale genres is slight, Guastavino is best known for his piano pieces, chamber music and, above all, songs – art songs, songs for schoolchildren (‘canciones escolares’) and choral arrangements of his own songs. The early songs, especially Se equivocó la paloma (1941) and La rosa y el sauce (1942), are still among those most often performed and recorded. His longest and most fruitful collaboration began around 1963 with the Argentine poet León Benarós, whose poetry forms the basis of more than 60 songs. Of these some of the finest are found in Flores Argentinas (‘Argentine Flowers’, 1969), a cycle that displays Guastavino’s characteristic melodic lyricism and sensitive text-setting, as well as his strong inclination towards texts on themes of nature. The discography of his works has grown steadily since the early 1980s and features such artists as Ameling, Berganza, Carreras and Cura. Notable instrumental works include Diez cantilenas argentinas for piano, the series of Presencias (for various media) and the Clarinet Sonata (1971). Juan Orrego-Salas (b Santiago, 18 Jan 1919). Chilean composer and musicologist. In 1943 he completed his composition studies with Pedro Allende and Domingo Santa-Cruz, and also took a diploma in architecture. He taught history at the Santiago Conservatory and conducted the Catholic University Choir, which he had founded in 1938. From 1944 to 1946 Rockefeller and Guggenheim grants enabled him to study in the USA: he studied composition with Thompson and Copland and musicology with Paul Henry Lang and George Herzog. He was then appointed professor of composition at the University of Chile (1947), editor of the Revista musical chilena (1949) and music critic for El mercurio (1950). After completing the degree of Profesor Extraordinario at the University of Chile (1953) he returned to the USA with a second Guggenheim Fellowship. Back in Chile he was for two years director of the Instituto de Extensión Musical and dean of the music department of the Catholic University. He moved again to the USA to found and direct the Latin American Music Center at Indiana University (1961–87), where he was involved in promoting Latin-American music through festivals, concerts, broadcasts and the compiling of the largest existing library of scores and recordings of 20th-century works from this area. In 1971 he received an honorary doctorate from the Catholic University, Santiago, and was accorded corresponding membership of the Chilean Academy of Fine Arts. He has won the Olga Cohen Prize twice (1956 and 1958) and a Biennial Chilean Music Festival Award three times. He received the Gabriel Mistral Prize in 1988 and the Chilean National Arts Prize in 1992. Works have been commissioned by leading institutions and ensembles, and his music has been widely performed. A neo-classical craftsmanship, tempered by free invention, is characteristic of Orrego-Salas’s music. Formal procedures taken from all periods after the Middle Ages are used without strictness. Something of the variety in his output is demonstrated in the modal linearity of the Canciones castellanas op.20, the colourful instrumentation and energetic rhythm of the Sonata a 4 op.55, and the declamatory monody and concertante writing of the cantata América, no en vano invocamos tu nombre op.57. Since 1961, Orrega-Salas has allowed musical absolutes to permeate his music and play a role in the creation of through-composed forms. Through an architectural process which he describes as ‘minimalist’ he focusses the listener's attention on the most salient modules of a composition, thereby imparting an element of referentiality to ever-changing textures. Robert Beaser (b Boston, 29 May 1954). American composer. A percussionist with the Greater Boston Youth SO, he conducted the orchestra in the première performance of his first orchestral work, Antigone (1972). He studied composition with Arnold Franchetti before entering Yale University, where his teachers included Jacob Druckman, Toru Takemitsu, Earle Brown and Yehudi Wyner (BA 1976, MMA 1981, DMA 1985). He also studied composition with Goffredo Petrassi in Rome and Betsy Jolas at Tanglewood. His conducting teachers included Otto-Werner Mueller, Arthur Weisburg and William Steinberg. He served as co-director of the New York ensemble, Contemporary Elements (1978–89), and composer-in-residence of the American Composers Orchestra (1988–93) before joining the composition department at the Juilliard School (1993). Among his awards are the Prix de Rome (1977), Guggenheim and Fulbright foundation fellowships, a 1988 Grammy nomination (Mountain Songs, 1985) and an award from the American Academy in Rome (1995). His works have been commissioned by the St Paul Chamber Orchestra (Song of the Bells, 1987), St Louis SO (Piano Concerto, 1989), Chicago SO (Double Chorus, 1990), Baltimore SO (The Heavenly Feast, 1994) and the New York PO. Beaser's music from the late 1970s onwards embraces the tenets of Romanticism in its epic scale, use of programmatic elements and tonal foundation. His melodic gift and finely developed sense of irony, however, elevate his compositions above mere exercises in nostalgia. Thematic variation and transformation is central to the structure of many of his works, particularly the set of variations that forms the second movement of the Piano Concerto. While the concerto quotes material from Beethoven to Bernstein, a subtle reflection of musical influence is more characteristic of Beaser's style. 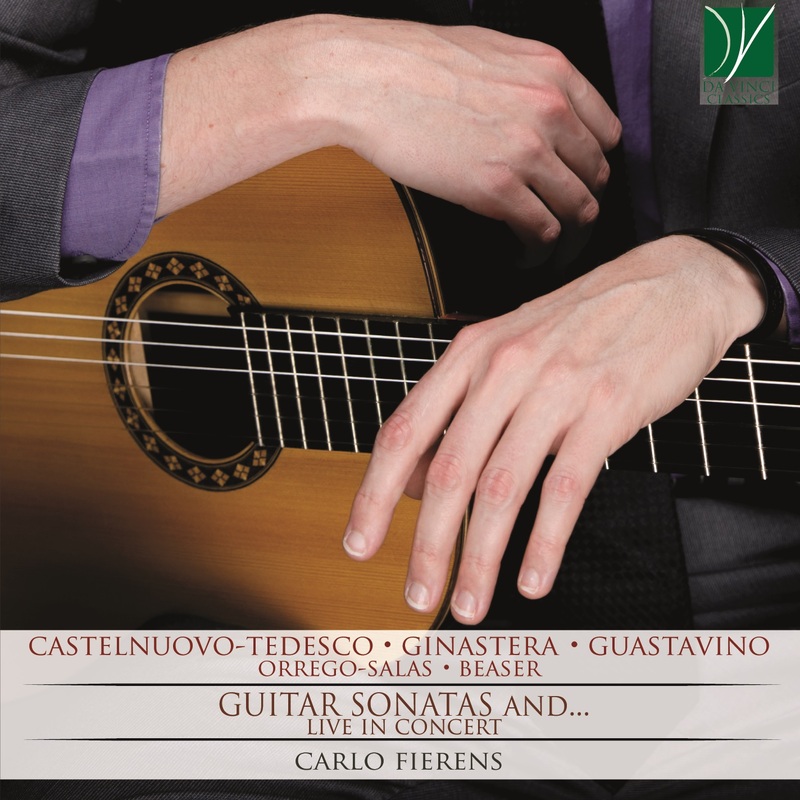 Carlo Fierens: Described as “one of the most attractive and engaging artists of the guitar nowadays” (Ricardo Iznaola), Carlo Fierens was born in Finale Ligure, Italy. Active as performer, musicologist, and educator, he has distinguished himself in all these fields. As a performer, he has won numerous prizes in International competitions (most notably the Alirio Diaz competition in Rome, the Indianapolis Matinée Musicale Competition, and the National Prize for the Arts in Italy). he is leading concert activities that have brought him to play in prestigious venues such as the Kennedy Center in Washington, D.C. His music has also been featured by broadcasting companies such as RAI (National Italian Television), National Public Radio of Armenia, National Polish Radio, and Radio Nacional Argentina. Sandro Cappelletto, music critic of the Italian newspaper “La Stampa”, selected him among the most promising musicians of the new generation, and wrote: “Fierens well captures contrasts, sudden changes of writing, returning a rich sound, now bitter, now sweet, in a phrase and a ‘breath’ of the time of execution already very aware.” Carlo Fierens started the study of the guitar with his father Guillermo, an acclaimed international concertist. He later studied in Trento with Norma Lutzemberger while completing musicological studies in the University of Pavia. He carried on his education in the USA, achieving an Artist Diploma at the University of Denver with Ricardo Iznaola and Jonathan Leathwood, and at the Jacobs School of Music (Indiana University) under the tutelage of Ernesto Bitetti.